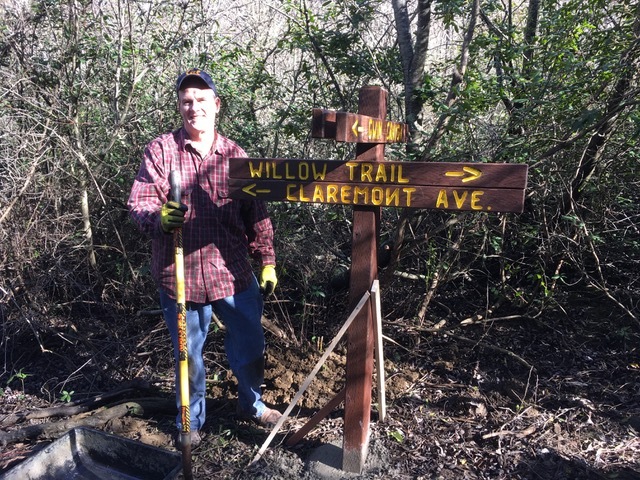 With thanks to Tom Klatt we now have a new trail marker where the Gwin Canyon Trail meets the Willow Trail just down the steps from Signpost 29. We installed the trail marker during our January stewardship day. We are hopeful that the Park District will add a trail sign of their own at the other end of the Gwin Canyon Trail where it meets Norfolk Road. Conservancy volunteers continue their work to make the trail easier to traverse by installing more steps and water bars and making a part of the trail less steep. We also will be installing logs along the edge to reduce erosion. Finally, the University has just improved the area just outside the gate at Signpost 29, making it safer to pull over and park. 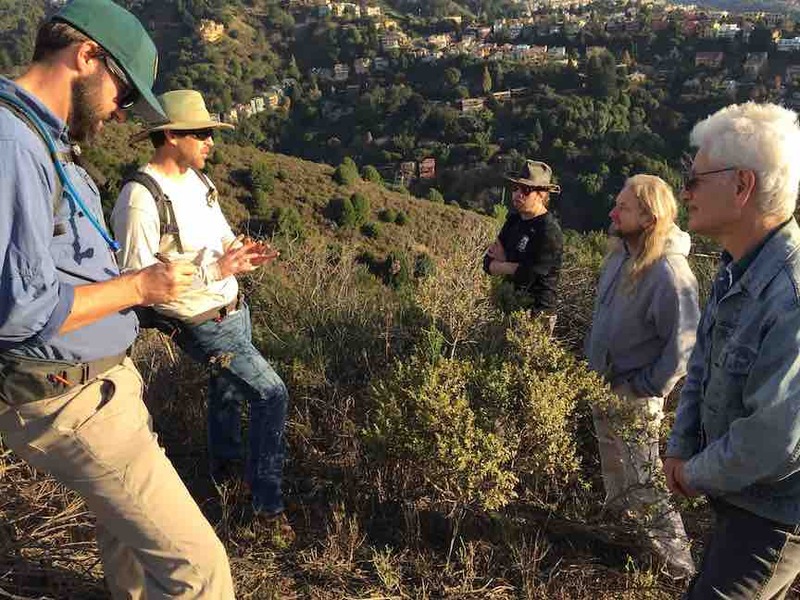 Conservancy members recently hosted a tour of Claremont Canyon with planners from the East Bay Regional Park District's Trails Development team, including trails manager Sean Dougan and Ward 2 Board Member Dee Rosario. We hiked up the Conservancy's new Gwin Canyon trail connecting Park District and UC lands, then headed over to the Stonewall-Panoramic Ridge Trail to assess its steepest section just below Panoramic Way. We are hoping the Park District will build switchbacks on this degraded section of trail for increased safety and accessibility to hikers. We'll keep you informed as progress develops. Through its stewardship program, the Claremont Canyon Conservancy has been building and maintaining fire trails in upper Claremont Canyon. Working with the landowners, in this case the University of California, our volunteers have improved the fire trail from Signpost 29 to Four Corners and named it the Summit House Trail (after the old inn that once stood at the top of the canyon). The Conservancy's efforts to link the Willow Trail near Signpost 29 with the Lower Norfolk Trail is getting a big boost from Eagle Scout Troop 6 in Berkeley. Troop member David Hood has make this work his scout project and he and other members of the troop have begun their work. It's hard to believe that it has almost been a year since we rolled out the latest update of the Conservancy’s trail map of Claremont Canyon—with a promise to have it out at trailheads soon. Well, that time has finally arrived. Since being acquired by Fairmont Hotels & Resorts in March 2014, the Claremont Hotel Club & Spa has stepped up its efforts to participate in conservation and stewardship activities in Claremont Canyon. Having long been the home of the Conservancy’s annual meetings, the Hotel, under the leadership of General Manager Len Czarnecki, has expanded its emphasis on sustainability. Two or three times a month Conservancy mem- bers gather to build and maintain trails, remove invasive weeds, collect trash, and make Claremont Canyon a great place to hike, walk your dog, or just enjoy the vista. Conservancy volunteers and Cal students joined together on Berkeley Project Day to begin to connect the Willow Trail near Signpost 29 on Claremont Avenue with the lower Norfolk trail. Just wanted to report two great projects last Saturday in our neighborhood: At the Demonstration Garden at Hiller and Old Tunnel, Gordon and Sue Piper led an enthusiastic group of volunteers. I had a chance to meet the new president of North Hills Community Association, Michael Schroeder (who was working his tail off!) and Carolyn Burgess, our terrific chair of Crime Prevention of NHCA. If you happened to stop by Garber Park on the morning of April 18, you would have heard mentioned such mysterious-sounding places as Evergreen Hillside, Fern Glade and Horsetail Meadow. These are the beautiful mini-landscapes within Garber Park that are winter restoration sites for the Garber Park Stewards. Nothing stays the same in nature. Willow trees are an example. They grow rapidly and also can die and fall over rapidly. That happened this past winter along the Willow Trail, named in honor of that species in upper Claremont Canyon. A large willow fell right across the trail making passage difficult, if not impossible. There has been much ado over UC’s proposal to remove fire prone invasive eucalyptus, pine and acacia from the slopes of Claremont Canyon. UC’s plan has often been described by opposition forces as a “clear cut,” evoking images of the denuded hillslopes following old fashioned logging operations in the Northwest. THANK YOU to everyone who volunteered on Earth Day at one of the two sites in Garber Park. As Bob and I toured the park we were both amazed at the amount of work that was accomplished. Another great stewardship day in the Claremont Canyon Regional Preserve. Although only four hardy souls showed up on this beautiful Saturday morning, we got right to work, splitting up into two locations to rid the lower canyon of French broom. We were fortunate to have Ranger Jeff McKenna, who brought along some large and small weed wrenches and a lot of muscle power. We feel that the lower Preserve is pretty much cleared of mature broom and only young seedlings are appearing--in smaller and smaller numbers each year. As I write this post the rain is just beginning, and I smile thinking about our successful Martin Luther King, Jr. Day of Service Event just four days ago that brought over 45 enthusiastic volunteers to participate in our restoration activities along the riparian corridor of Harwood Creek, and how all our new native plants are being nourished by the rain. Barry Pilger saved the day by showing up with a gas powered hedge trimmer to rid the slope of several large stands of pampas grass. (We went back later that day with some old tarps and covered the pampas grass stumps to inhibit resprouting.) Ray Johnston also showed up and helped us rid the area of spurge (euphorbia) while the rest of us toured the rugged and steep area behind some homes as a site for future fuel break/wildfire mitigation work. AS I WRITE THIS ARTICLE, it is early fall and the Garber Park Stewards have just had another successful Creek-to-Bay Day. We really enjoy this event, sponsored by the City of Oakland, as it gives us an opportunity to highlight Garber Park’s unique wetlands and riparian corridor along Harwood Creek. In past years, Claremont Canyon was often used as a dumping ground for small-time, fly-by-night construction contractors and others who were not willing to pay the fees charged by official dumps. Debris of all kinds—car parts, plywood, plasterboard, empty paint cans, and even a few refrigerators and sofas—ended up on the roadside or down in the creek bed below the road.